The third Monday in July was a busy one at Sterling College. Staff and students impregnated a sow named Maple with sperm from Majestic Martini, a stud pig from Iowa — no easy task. In the afternoon, Hill Farmstead Brewery’s Dan Suarez arrived on campus to show students how to make beer. And in the campus kitchen, staff continued to break down and cook the 700-pound sow slaughtered the previous week into cutlets, pancetta, salami, bacon and sausages that they would dish out at campus meals. “She was really big, so she made it into a lot of things,” noted Anne Obelnicki, Sterling’s director of sustainable food systems. The next day, ominous skies compelled an instructor to cancel a learning session with the college’s two draft horses, Rex and Lincoln. Instead, a few students fanned out across the farm to cull ripe veggies and herbs; they later showed up at the kitchen’s back door drenched from the rain but laden with boxes of chard, cilantro, scapes and broccoli. For two consecutive summers, the 130 acres of rolling fields in Craftsbury Common — along with the resident turkeys, pigs, hens, rabbits and cows — have provided both sustenance and teaching tools to Vermont’s Table, a two-session program in sustainable food systems. Each five-week session has a different focus: The first is devoted to animal-related skills such as butchering, sausage making, and dairy and cheese production; the second teaches students about everything from raising vegetables, fermentation and tractor skills to food writing and entrepreneurialism. Vermont’s Table is a natural outgrowth of the college’s undergraduate program in sustainable agriculture and reflects a national trend toward the growth of academic programs in food studies and systems. In 1996, New York University introduced the first master’s degree program in food studies. Since then, schools including Indiana University, Chatham University in Pittsburgh and the University of Vermont have rolled out food-centric degree programs, as well. Concurrently, schools such as Yale University have started campus farms to fuel their kitchens and expose students to food production. Vuoso and her fellow students — who ranged in age from 20 to 62 — were rooming in the former digs of the Inn on the Common, which the college purchased two years ago. Outside the building, hydrangea bushes drooped low over the lawn. Inside, the first floor had became a veritable classroom: Curing guanciale could be found hanging inside a refrigerator. In the next room, numbers and prices covered a dry-erase board, left over from a lesson on the costs and potential profits of turning vegetables into sauerkraut. Down some creaky stairs in the basement, carboys of ale were fermenting after the previous day’s lesson, as were jars of week-old kimchi and sauerkraut. Each student arrives with individual goals, though these may shift over the course of the program, given its breadth. Vuoso, for instance, came to witness a tightly calibrated food system firsthand, as well as to discover ways to expand the reach of healthy produce. “I wanted to see where interventions can happen so that people can gain more access to fruit and vegetables,” she said. A week in, however, Vuoso admitted that her head was spinning from the classes and the pace of learning. Patterson grew up in Craftsbury but left Vermont for college and to work abroad; he recently returned to his home state, drawn in part by its food renaissance. The Kingdom’s wholesome rep has helped attract both full-time college students and career changers to Sterling. “Some are expressing dissatisfaction with their jobs now, or they want a career that’s more grounding,” Patterson said. Sterling’s staff would love its farm-to-table program to be as self-sustaining as possible, but local food ebbs and flows with the seasons. One student study showed that, over the course of the past year, 12 percent of the food consumed by students and staff came from campus, while 60 percent was local to the Kingdom. In summer, that figure is close to 100 percent, said Patterson, barring such items as lemons and peanut butter. The simple act of eating well is at the heart of everything at Sterling. Obelnicki, who is also Vermont Table’s head instructor, arrived last year to ensure that the kitchen would exemplify that principle, and she was given free rein there. “We worked hard to take the kitchen to another level,” she said. Besides using what’s available on campus, the Sterling chefs draw from some 30 local producers, including Pete’s Greens down the road. “It’s not outside of the ethic, or driving the ethic. 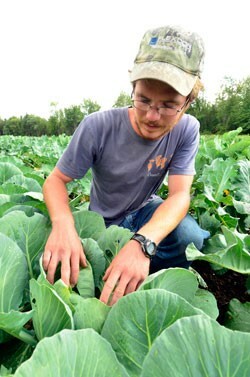 It is the ethic of the college,” Obelnicki said of the farm-to-table program. She’s no stranger to building food systems: After attending the Culinary Institute of America, Obelnicki worked in various roles to link farmers and restaurants, most notably as a project manager for the national nonprofit Chefs Collaborative. Still, she said, “I’ve reached something here I’ve never done in the past.” That is, she has deepened the campus’ self-reliance and extended it throughout the year. Sterling uses all the food it produces — including last summer’s glut of cucumbers, which staff and students turned into 125 pounds of pickles that lasted until March. Obelnicki, assistant kitchen manager Jimmy Kalp and the rest of the staff are busy from early morning in their kitchen, baking bread or curing meats or thinking up menus incorporating whatever is on hand — such as the 50 pounds of cauliflower, four cases of chard, bunches of cilantro, trays of eggs and quinoa that filled the larder last week. “We’ll make some into pesto, and some we’ll steam with salt,” Kalp said of the pile of chard at his feet. At each communal meal, the hot and cold dishes — mostly vegetarian — are arranged on two long tables. Vuoso said she is “picky” about the meat she eats; Dalal was concerned about the offerings, as her diet is both vegetarian and dairy- and gluten-free. Yet both have sailed smoothly through each meal. “Our plates are very colorful,” Vuoso observed. On this Tuesday, the meal consisted of almost creamy sweet-and-sour pork; a cauliflower-and-carrot salad sprinkled with sunflower seeds; a beet salad; another salad of cucumbers and radishes; and a heaping bowl of lightly dressed, buoyant mizuna, a peppery green. In contrast to the abundance here, Vermont’s Table is not yet financially in the black. “It’s getting there,” said Obelnicki. Even so, the college is investing in the farm’s infrastructure — expanding gardens and building a new center that will include greenhouses, an icehouse, classrooms and a modified horse barn — to attract an ever-growing crop of students.